I have been thinking about how thankful I am for the friends God has given me. God has surprised and blessed me with the right friend at the right time in my life, and so often a friendship grows out of a “need seed”. Somehow, when I least expect it but at the exact, right moment, a friendship blooms where I may have least expected it. I have seen His fingerprints on each one and I can trace it back to His heart of love and compassion every time. He knows my needs. He knows that despite my fiercely independent strong will, and love for solitude, I need others to be all I can be. Each of the precious friends that God has brought into my life have been for a purpose. At times, it has been clear, other times, I would not know I needed their specific love and friendship until the moment of testing. And the moments of testing come and try each friendship. Some have failed and gone by the wayside…but others, oh, dear ones, they are like mini portraits of God’s beautiful characteristics exemplified uniquely in each life! Magnificent artwork displayed for His glory. I realize God has been so gracious to me in this area. He gives me friends who are generous in patience for my non-stop ideas and spastic-ness (word found only in my dictionary of Dawn-isms). He gives me friends who stand in defense of my character when others have tried to tear me down. He has given me friends who stand by my side faithfully in a difficult time, reflecting so wonderfully His very faithfulness, that it has caused my heart to broaden in the scope of my comprehension of His goodness, mercy and compassion. My heart has broken with love overflowing in gratitude for the friends God has given me, and I know I am not worthy of one of them…but I am in awe of Him, because He considers me. He whispers, “It is not good for you to be alone.”, and I know He means for me to grow in trust and love for Him and others by His grace. His provision. The journey of my life has brought me through many seasons and friendships. I am grateful especially for those that God has brought into my life for purposes which seem to magnify greatly His perfect choice. In the beginning of my faith walk, I prayed in the privacy of my bedroom alone on my knees, ” Lord, I don’t want to do this alone.” The next week He answered that prayer and my sweet sister Sara, accepted the Lord and together we were off, on an adventuresome journey, to places we had not yet known! Is God Faithful? Ask Sara! I stepped forward to serve at the church I attended working with kids, naturally! Two of my dearest, most faithful, friendships were born with the teens who stepped in the gap to help out as I tried to shine for Jesus with 12-20 first graders. We shined! Our friendships remain, even as they are adults now. Is God Faithful? Ask Steph and Mel! Becoming a mom was not a planned step for me- but God had a plan in it for me. He provided an angelic Fairy Godmother for my daughter who made sure I had enough diapers from my Baby Shower for the first year of her life, while letting our season of friendship endure through many life changes. She is a blessing to me and a beautiful, precious friend. Is God Faithful? Ask Sandy! We loved the time we had living in the rural part of our small state. In the end, we had to move- it was another season of trial and tribulation. In the most difficult time of our life as a family, it was not the church that came through in our hour of need – but God only needs…one…willing, available, person – to help a few hang on to the hope of His goodness. God used one special family in particular, in our town, who really laid all down to help us in our time of need. Literally, dropping all and coming to our aid. Is God Faithful? Ask Lauree! You know I could go on and on about the many friendships- I have had and how God has revealed himself behind the scenes. He is faithful. We are here to help each other- not just to get through… but to get through it all Magnificently! Because – God is faithful. He cares about our needs. So, be open to who he might bring into your life next…you never know what “need seed” might bloom your next magnificent friendship! I thank God for my friends. They may be few, but I am proud of their beautiful, precious lives and how they have made me richer as they have generously poured their lives into mine. My friends remind me of the Marines. 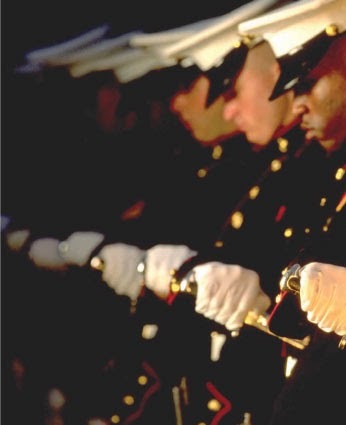 The Marines are known for honor, courage, strength, integrity and, of course, loyalty. My friends are like that. Ever present to offer encouragement, support – up for whatever I’m bringin’ ! and they assure me of His Love and Power when I am doubtful and weary. You are blessed to have these friends in your life! A year of diapers! Amazing! Enjoy your day! I thank God that he has placed you in my life…how much richer am I!Love you dear friend!